The possibilities of utilizing vinyl-cut lettering are almost unlimited. The advantage is provided by the extensive colour assortment, swift availability and application in very different conditions. In addition photos, images and graphics can be printed on the self-adhesive materials. Oftentimes adhesive films are the quickest and cheapest solution, however, when appropriately applied and duly maintained they are also long-lasting – depending on the chosen base material from 5 to 10 years. Sometimes it is practical to laminate the adhesive films in order to secure even greater durability and resistance to mechanical damage and environmental factors. For manufacturing vehicle lettering we use the materials by Avery, 3M and Mactac with 7-10 year factory warranty. All these materials are UV-resistant, easily applied and durable on convex/concave surfaces. The standard colour assortment includes more than 120 colour hues. Pictures and objects too complicated for vinyl cutting we print on the same materials and laminate for protection from mechanical friction. Covering large surfaces with vinyl lettering is often necessary only for the period of a campaign. For easier subsequent removal of the materials we use special removable short-term film materials. A wide range of frosted window films are now available to create the popular etched effect which can be used for a variety of applications to provide privacy and cut down on UV glare. The durability of PVC banner materials allows manufacturing advertisements with the area up to several hundred square meters. Depending on the complexity of the design we use either special self-adhesive films or print the necessary images directly onto the banner material. We also install PVC banners upon request. For stretching large canvases on the frames we use special tightening devices, which secure the smooth surface of the banner and exclude waving. For smooth and prompt fulfillment of printing and lamination works we use a wide-format MUTOH printer and KALA laminator. In outdoor conditions, especially for avoiding moisture, it may be necessary to encapsulate the printed paper. NB! 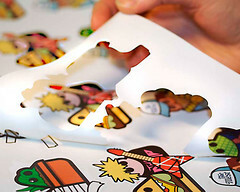 When ordering the work, it should be taken into account that the printed material must dry for 24h prior to lamination. Only on such condition warranty for work will be provided.